I was born and raised in beautiful Port Angeles, WA. Besides playing the flute, I did a lot of hiking, fishing, skiing, swimming in lakes, along with various other shenanigans. After attending the University of Puget Sound in Tacoma, WA (go Loggers….yes, Loggers), I moved to Eugene, OR to pursue my M.M. 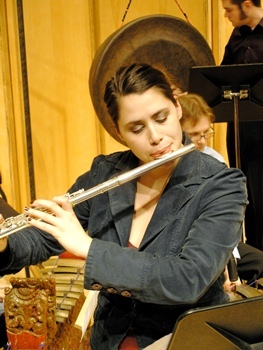 in Flute Performance at the University of Oregon. The incredible pastoral quality of Oregon, the abundance of wineries, and events such as the truffle festival really helped me endure the drizzly winters there. I recently moved all the way across the country to the lovely Durham, NC and discovered vinegar based barbeque. Besides teaching private lessons, I perform with the Duke New Music Ensemble [dnme], and freelance in the greater Triangle area. I like playing the flute, but I like making music more.